This is not a good idea for someone who is new in my opinion. Anyway this is what I will do. When a pair is pretty much always volatile GBPJPYI, GBPUSD, EURJPY, will open both. sides of the price action, 1/4 of my normal position then monitor in front of my computer and use a wider stop loss than normal. I trade these pairs and know whens the best time to try this, under what conditions and with what pair. But should conditions change, I close win or lose. Like I said terrible idea for new traders. But definitely always use a stop. of course I trade without stop losses! 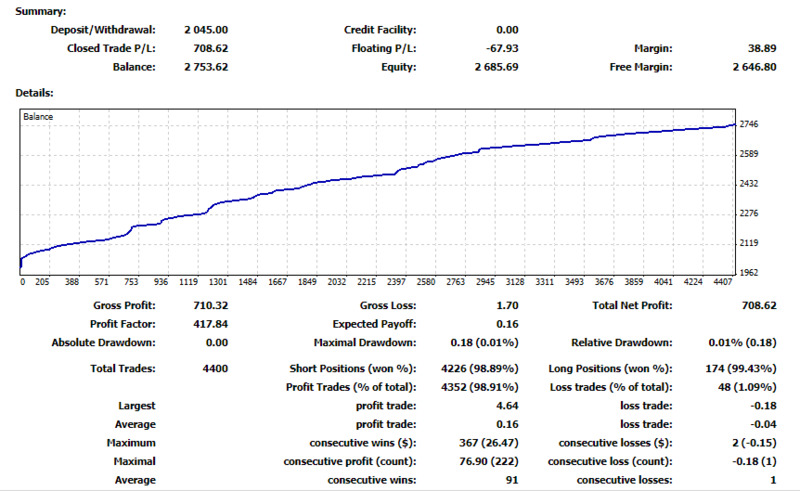 39 days of live trading wihtout stop losses. I know not very good, but I am improving! I think those (profit) stops II am using are too tight! 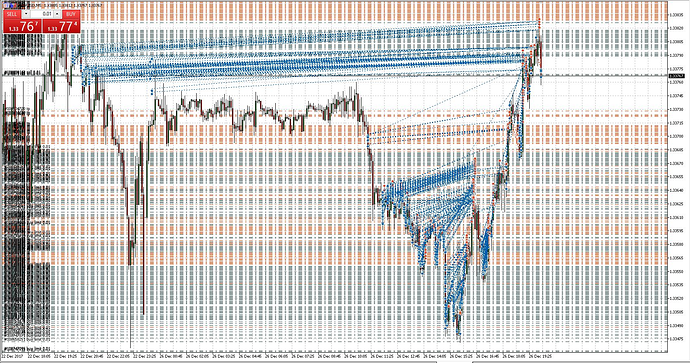 Perhaps I would do better, with huge lot sizes and tight (stop) losses, LOLZ! HARDLY! always use a (profit) stop, not much point in using a (loss) stop unless you are trying to lose $. I can tell you I make thousands of live trades a month and I do not use a (loss) stop: which you call a stop loss? maybe you should tell the truth? and call it what it is a “Realization of LOSS” STOP. RT’s have been duped with the SL (STOPLOSS) using a stop loss to realize a loss is just silly. Perhaps you would do better to focus on your profit stops? regardless its important to know the truth, and considering what the ESMA is doing : the days of lying to retail Traders and robbing them are over. Broker liquidation activated. 80% of current brokers will go out of biz because of the ongoing continual efforts of the ESMA to change things , so there is more HONESTY, and transparency in the markets. Yes loss of RT’s using stop losses will remove some of the fuel from the fire from the middle of the market. but I cannot sit idly by and allow the stop loss lies to go on. If you are an RT and dont know better, ok use a stop loss if you are scared or not a very good trader. But know that the real professionals dont use stop loss orders to realize a loss! they use them to protect profits from sliding out of a trade that is in the money. Automated or a scalping on caffeine? The use of a stop loss is important for us beginners, as we don’t know or understand the markets properly enough, and therefore have not developed the psychological skills to be able to close a trade manually. A beginner will let a losing trade go, even while seeing half their account disappear, they will fight to leave the position open, in the hope the trade will return to profit. scalping on caffeine, how did you know? its time to brew some now! old link is bad mfxbook geeked out on the time shift to GMT+3 at Turnkey new link is Stephen System by rrram2 | Myfxbook SAME account! Not only is it doable, but I would say advisable - but only if you are trading highly volatile instruments like crypto. Such volatile markets are full of whales who often manipulate the price to purposely squeeze prices to trigger stop-losses. Just make sure that: 1) you aren’t risking more than you can afford to lose in any given trade, 2) you are quite sure about the broader direction of the market given a combination of fundamentals, TA, and sentiment, and 3) you are prepared to have a forced liquidation of your margin account in the event you completely get it wrong. If you can’t accept these criteria, don’t trade on margin, especially in crypto. Yes majority of beginners not know how much risk they should use in trading. When they go fo trading they are confused especially when positions are out of their range they suffer from high loss. Beginners can manage their risk with stop loss. It is a supporting tool when they are experienced they can skip it it is totally optional. I’m not here to criticize your methodology. First and foremost, i would like to congratulate you on your current success and your feat is quite extraordinary. Your conviction in your trend determination is truly awesome, and i’m hats off to you for that. Your patience for drawdowns are incredible. Let’s look at your chart on equity Growth, basically the red line on Growth can be ignore. What truly matters is the yellow line (equity growth) . From Aug 17 to Sep 1st, max drawdown reached about 8% (on the 29th Aug). From Sep 1st to Sep 9th, max Equity growth reached around 9%. After Sep 9th equity continues to grow to current positive 35.83%. I can see that on the Sep 10th, 17th and 25th, there were 3 more large drawdowns, which one of them probably contributed to your max drawdown of 8.99%. 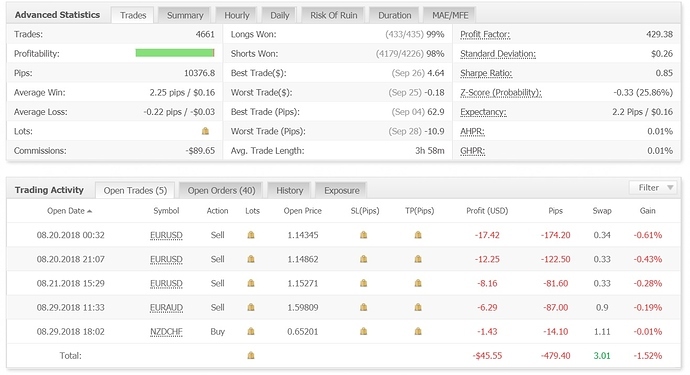 From your 5 open trades chart, i can see that you can tolerate a total drawdowns of -479.40 pips. This can only means that your every trade entry are probably at minimal position lot size. 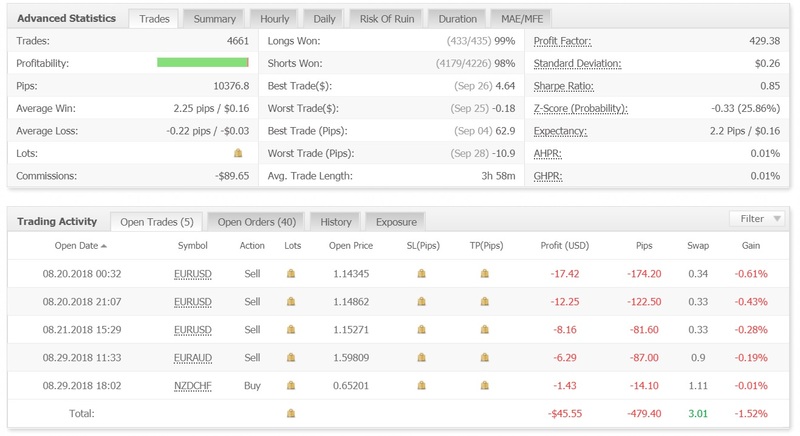 From the 3 open EURUSD trades, position are opened (or averaged) at an interval of 40 to 50 pips difference. I also notice that you have 40 pending orders waiting in queue. From my observation, i can see that your are a true contrarian, and have perfected the art of counter trend trading thru the use of a single powerful technique called “AVERAGING” . i have just 3 question for you. What’s your backup plan if a major trend reversal occurs and move against your Major trend determination by say 2500pips? Your max drawdown may reach as far as perhaps say 50%. How confident would you be, that you will still be able to recover from your losses? How long do you think it will take for you to recover those losses, if a black swan event does occur. Just some food for thoughts. No offence, i hope. i really meant well for you. 100%. I dont trade the trend, I am trading the reversals, and I am playing up to 2000 pip ranges, this is a fresh account, eventaully I will only draw down on banked profits, and I wont overleverage no worries. I reamin 100% confident if the world ends tomorrow due to WWIII I guess we need not worry? what if, isnt even a consideration. How long will it take me to recover? a few days is all I need. Drawdown is not a loss, lose that loose thinking behind, DD is risk on, the more risk I put on the more I take off in profit. DD is a mortgage and all part of the plan, and I prefer the +swap trades take note of that. I play the extremes and I play the middle, and the endzones. this isnt my first live account, and it is the smallest! trading a large account is easy! trading the small accounts is where you need skill to prevent from overleveraging, and the small accounts are the hardest to trade, and this account is a demonstration for a friend of mine trying to learn to trade. Many thanks for the comments! I appreciate them! but no worries, soon I will be at 100% profits and will take out the initial deposit, and start again at $1000 with their money. But key here is I trade 17 different models…and this is only one, with the intent to trade huge VOL in a $1000 account, because the broker needs 500 lots traded RT before they get up off that $1000 bonus. And this will be the first time this broker probably has ever actually paid the bonus out! 99.8% of all swans in the world are white! and guess what? why does no one realy consider how easy it is to make a deposit to your account? I mean margin call? who cares send the broker a G. problem solved. Your averaging method are really remarkable. I must admit. I did thought of this kind of method before, but didn’t think it would be possible to execute. Thus, i give it a pass. Psychologically, i don’t think i can withstand such heavy drawdowns. All the best for you man. May the force be with us! this is only one of my trading MO’s, but suffice to say I am a huge fan of conntratrend accumualtion for obvious reasons. This is one of rrrm2’s charts… his system builds profit and equity at the same time it’s generating DD. Is my broker greasey? Or my understanding flawed? 500 lots traded RT before they get up off that $1000 bonus. Now brokers may have to think twice before offering such bonuses to traders like you. Actually, your method can be easily coded into an EA and run from a vps isn’t it? Have you ever considered that possibility? I have lots of trading bots, but the trouble is leaving a bot running on a broker 24/7, that is killing them doesnt go over very well. aND BOTS that once worked perfect are getting tricked now someetimes or blocked, understand mt4 and there are all sorts of BO tweeks to trick things up, sadly there are very few brokers that are what they “should”: be. I am not going to go into the 1001 shady broker tricks, but the bonus is a trick to get the RT 100% to overleverage, overleverage is the #RT error after the stop loss order. A bot cannot be trusted to be left alone for too long for me, overnight is swell I need to sleep. But when I load my bot on a broker and it eats the liquidity bot(S) at their LP(S), it gets targeted. And thats why yet another new broker. After working with a broker for a while in mt4 I can find all the bugs and bo tweeks they have done to make it harder for the trader to make $. and think about this, if you find a broker where you cannot do something, i.e. they changed backoffice (BO) settings on mt4 so you cannot do something, it is those things they prevent you from doing that you need to find another broker that is less restirctive where you can do those things. for example Blueberry isnt any where near as good as anyone thinks they are. in the DOM, they block leapfrog style, entry stops with tight tpt’s. ANd in DOM they set min profit stop to 3.0 pips, on Turnkey I can set it to whatever I want. The game is about the profit stops, forget the loss stops. Turnkey I can place inside ask quotes, and inside bid quotes (placing orders inside the spread is what this is), blueberry nope! mt5 is really best but I have little to no software for it. Ah ha! No wonder you can execute such a style. Trading manually is psychologically too hard to stomach seeing the account all red.